Atlanta Zoning Ordinance Closes The Varsity Jr.
After 45 years on Lindbergh Drive, The Varsity Jr. closes tonight after a losing its zoning fight with the City of Atlanta. The Varsity Jr. had wanted to build a new modern facility at its location, but could not meet the City’s zoning requirements. You can read the open letter from the Atlanta landmark here. 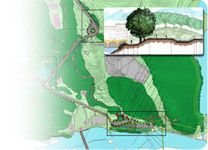 After a few million dollars and several years, the City of Sandy Springs opened the Overlook Park – 27 acres of green space, playgrounds, a 300-person public pavilion and a 170-year-old stone chimney, the last standing part of a home belonging to the settler Powers familyat the end of Morgan Falls Road on the banks of the Chattahoochee River. Foreclosures, short sales, declining values cause the fair market value of a property to sometimes fall below what the owner owes the bank. Even though the property owner is under water or upside down with the mortgage greater that the property is now worth, the property owner may not get any relief from the tax assessor. Fulton County continues to consider the amount of the mortgage in assessing a property’s valuation for tax purposes resulting in valuations sometime double the fair market value of the property. Property owners have options and can appeal. Contact GZB and the law firm of Williams Teusink Larsen to learn more. After twenty years of inactivity, the Snellville City Council intends to awaken the Snellville Development Authority to focus on economic development throughout the city. Snellville Mayor Jerry Oberholtzer hopes to appoint members to the revived Council as early as August 23.